Nurses know how important communication is in the midst of their typically fast-paced and hectic day, and without excellent communication skills, time can be wasted. 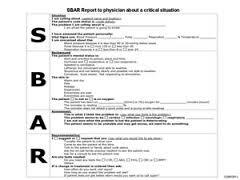 When nurses need to relay information concisely and quickly to physicians, the SBAR communication method is a favorite way of getting information across. “SBAR was originally developed by the military as a way to standardize communication,” says Kimberly Mays, RN, MSN, MBA, CJCP and RN consultant with the Joint Commission Resources. SBAR crossed over to medical use when nurses with military experience thought the method would help improve practices, especially when relaying information to physicians quickly, she says. “SBAR helps a nurse organize information for why they are calling a physician,” says Mays. The SBAR communication method relies on standard steps which a nurse can fine-tune with experience. The acronym stands for the steps needed – situation (state what is going on very briefly); background (relevant information about medications or prior diagnosis); assessment (what you think is going on and needed); and recommendation (what are you asking the physician to do – change medication or reassess patient, etc.). “It conveys the salient ideas and gives physicians all the information they need to make a decision,” says Mays. Because the information is specific and exact, it helps eliminate any unnecessary data and makes the interaction very precise – just what’s needed in the situation. “When it’s nurse-to-physician [communication], there’s a little more stress because of the roles each of them play in the care of the patient,” says Mays. SBAR condenses the information down into several points – Why am I calling? Why does it matter? What do you want me to do about it? But nurses who use SBAR also learn tricks that make communication with colleagues easier and more efficient. “SBAR promotes critical thinking,” says Mays. As you begin to learn the SBAR method, it’s always a good idea to have someone familiar with the process look over your sheet before you make that call. As you become more familiar with the method, you’ll be able to narrow down your information rapidly. And because nurses are often not able to recommend a medical treatment and physicians may not accept a medical recommendation, says Mays, SBAR helps you shape your observations and suggestions in a way that might make a physician more agreeable to what is needed. “Communication makes a big difference in how well a nurse’s message is received,” says Mays. For more information about SBAR, check out this chart from the Massachusetts Department of Higher Education. What do you think of SBAR? Do you use this method?